Last night, I came across the 8mm reel that started it all. The Lost World was one we (cousin, neighbor, and myself) pooled resources to order out of Famous Monsters #29 (aka Flesh Eaters edition). Should my purchasing partners come calling for respective third interests, it is here and ready to run. My viewing was a first in forty years. Somehow the image had dimmed, as though its black-and-white found a means of fading. We'd sent $4.95 to Captain Company in that summer of 1964. 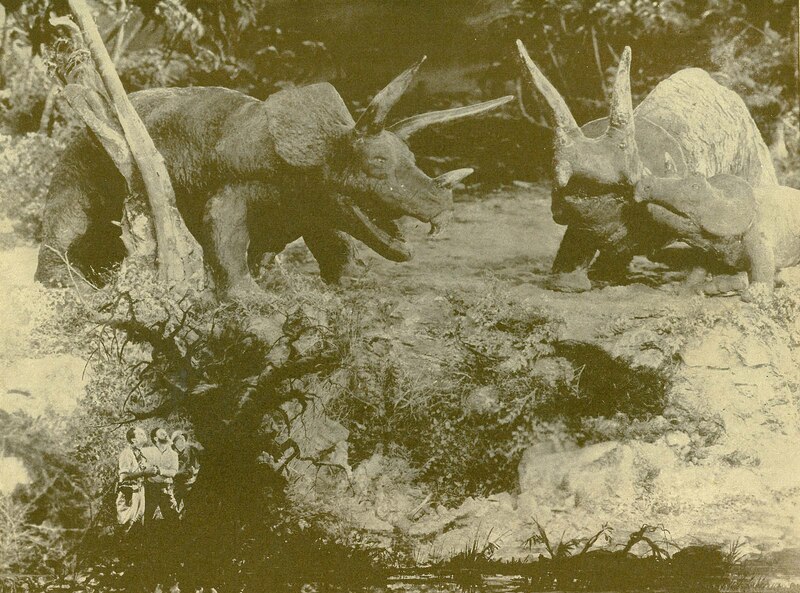 FM's ad promised The Lost World's dinosaurs to be the most realistic ever put on film. As of that year it was true, and easily borne out by inspection of a then-recent (1960) remake. 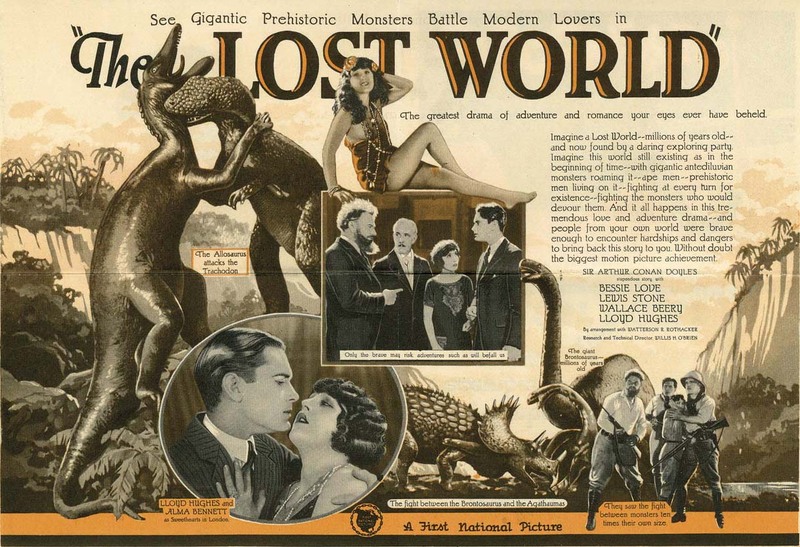 Our Lost World was made in 1925 and effects were supervised by Willis O'Brien, King Kong's creator. We realized that going in thanks to Professor/FM editor Forrest Ackerman, and so bought with confidence. 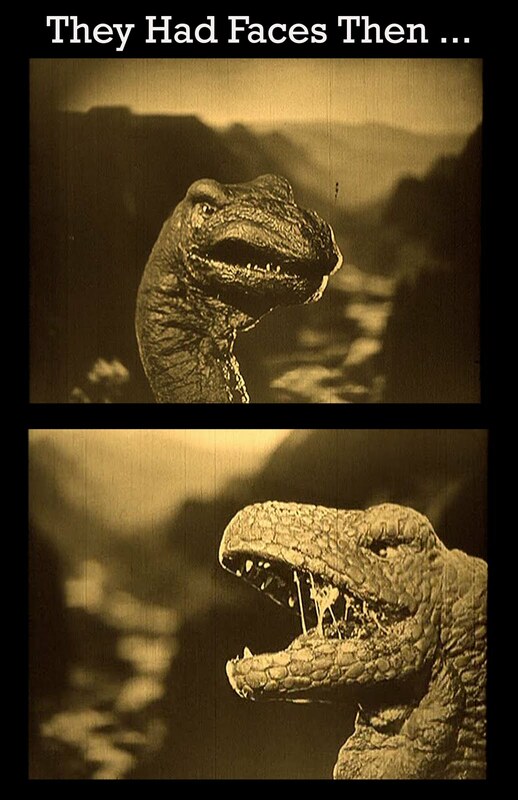 Those two hundred feet of The Lost World (originally a feature) accommodated four battles to the death among its prehistoric cast, so respective ten-eleven-fourteen year old dollars were wisely spent indeed. We ran it for nickel and dime admission in my parent's basement, sometimes in combo with Castle Films' Dracula, our accompanying purchase that season. 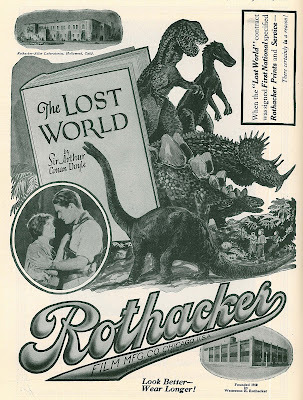 I was surprised to find that The Lost World had been prepared for 8mm by Encyclopedia Britannica, an entity not otherwise given to endorsement of dinosaur battling, thus my explanation to parents that its acquisition was justified for educational values therein. Would Encyclopedia Britannica lend its imprinteur otherwise? Remarkable the efforts we made to legitimize a beloved, but disreputable, genre. The Lost World's creatures were menacing but somehow personable. They snarled but also wagged tails. You knew the Brontosaurus would come a cropper for not being carnivorous. He's noble but has a brain the size of a pea so gets eased over a precipice by the habitually anti-heroic Tyrannosaurus Rex. 8mm titles indicated the Bronto would die slowly in swamps below, but FM's FJA assured us that selfsame brute was not only revived, but let loose to flatten London bridge in a fuller dish Lost World he saw back in prehistoric 1925 (when people maybe had real dinosaurs to contend with). FJA alerted us as well to missing link ape-man Bull Montana, also resident of an unexpurgated LW lost to ages (mine at least). Ackerman published stills to verify what I might have discarded as myth. For years, there was no more Lost World for me than what that 8mm reel contained. Serious film collecting, which really just means more dollars spent chasing thrills that can't help diminishing as one gets older, finally yielded a dupe from a dupe off a Kodascope, the latter being authorized 16mm prints once sold for home entertainment. These boasted improved visuals and longer running time. Still, they were short by nearly half from what Forry J and kinsmen saw. The Lost World had been trimmed to essential bone by a distributor set upon adapting merchandise to saleable length. More than one fan developed O.C.L.W.S., which was Obsessive Compulsive Lost World Syndrome, a malady wherein the afflicted spend lives in search of missing Lost World footage, their quest as frustrating as Professor Challenger's for his elusive plateau. The stunner here was fact they actually scored the 1925 original ... well, at least most of it ... and reliable authority suggests even more Lost World nitrate has revealed itself since. Forever, it seemed, The Lost World was anybody's show. Having gone Public Domain long ago, it's been plundered for nips and clips that even in truncated circumstance can delight newcomers. Like with Ray Harryhausen's output, these stop-motion puppets correspond to beats of our hearts. My generation (and ones before me) love them with greater fidelity than later crops are likely to maintain for impersonal Jurassic Park residents. Blackhawk Films and Griggs-Moviedrome sold what they could pull off Kodascope copies through the sixties and seventies. A grand culmination arrived with a near-full length Lost World unveiling at 1998's Syracuse Cinefest, said restoration having originated with George Eastman House. That version surfaced later on DVD as an extra with 20th Fox's remake, a bargain disc whatever one's reservations about the 1960 version. Now with more footage having turned up since the 90's rescue, it seems somehow appropriate that a fully intact Lost World remains beyond reach ... at least of any institution's willingness to spend yet more revisiting it. 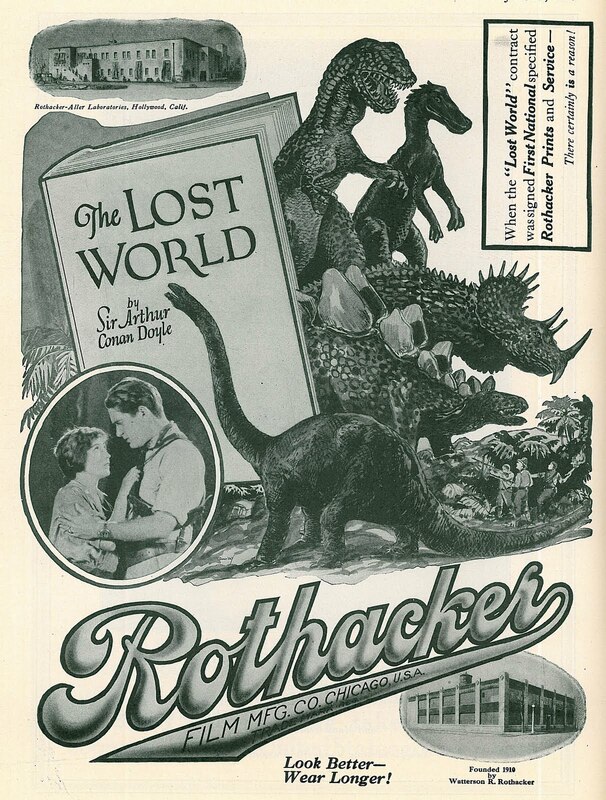 So here's what dogged me for years about The Lost World: Why didn't Hollywood make more dinosaur movies? Well, we could ask the same thing of King Kong. You'd figure Willis O'Brien's phone would ring off its hook in wake of those two. I don't know how The Lost World sold in 1925, but assume it was a hit. Some patrons are said to have thought the dinos were genuine. At the least, First National had stock footage I'd think could be spun off into a hundred low-budget replicas, plus there was FX test film (included on Fox's DVD) that could by itself satisfy demands of a poverty row contender. Instead it was Hal Roach's One Million BC in 1940 that became one stop shopping for monster scraps, but his were blown-up lizards no more or less convincing than ones Irwin Allen decorated in 1960. I did read Scott MacQueen's American Cinematographer account of how rights to The Lost World shifted around after 1925, so I'm not sure what if any ownership Warner Bros. would have inherited after they absorbed First National, but wouldn't it have been neat seeing O'Brien's creatures popping up in sci-fi adventures right through a black-and-white 50's? I'm picturing Frank Lovejoy and Paul Picerni leading a Warners-backed expedition, with Joan Weldon or Phyllis Kirk lending girl scientist assist. Maybe Frank could wear a beard and look scruffy so as to match up with Wallace Beery footage. He and Paul could fight over Joan/Phylis just as volcanoes erupt and all those million plus thirty year old dinosaurs stampede across process screens to amaze a new generation of filmgoers. Somebody send me back to JL's office around 1953! I could give as persuasive a pitch as Daffy did in The Scarlet Pumpernickel. Coming in Part Two: Irwin Allen's Immortal 1960 Remake of The Lost World. Having seen the Lumivision Kodascope copy (which has an original trailer as an extra) as well as the David Shepard Image version and the GEH restoration on the Fox DVD, THE LOST WORLD is well represented on DVD. 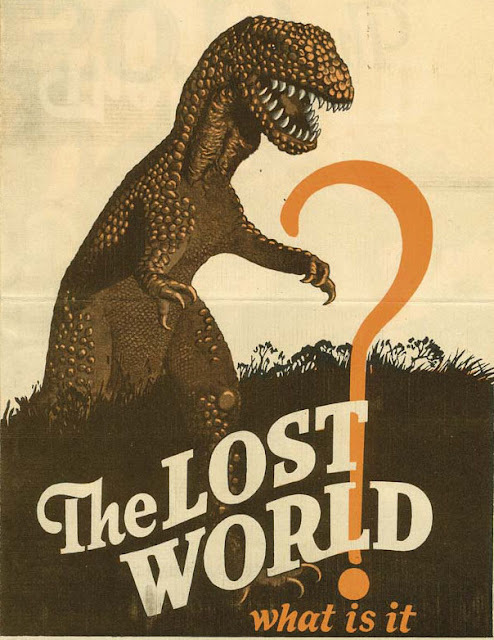 THE LOST WORLD for $4.95 plus .25 S & H in 1964 would cost over 35.00 adjusted for inflation today. Lumivision's restoration of the Kodascope was a beautiful job. It's worth seeking out on DVD for special features (including a trailer) not part of the more recent disc offerings. There are some who maintain that the Kodascope is actually a more satisfying "Lost World" than the complete version. For that $35.00, I could have bought the Griggs-Moviedrome version! Was the restoration really in '98? I saw the premiere at Eastman House and if you's asked me, would've said it was only 5 or 6 years ago. At the sold out screening I went to, someone got up during the Q&A with the restorers and insisted there was a dinosaur sequence on the laser disk that wasn't included in the new version (and refused to be told otherwise.). 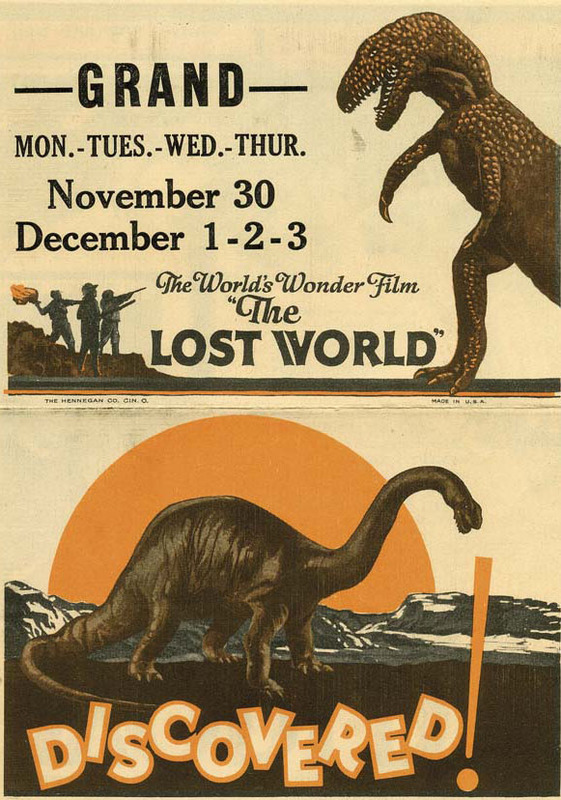 I recall a book stating that RKO bought the rights to Conan Doyle's Lost World before the release of King Kong -- think it was Behind The Screen or The Liveliest Art. The writer claimed it was fairly common to to buy up not only previous versions of a film but similar properties to pre-empt litigation. In addition to a lost land of prehistoric beasts, the book has Professor Challenger releasing a scary (but ultimately harmless) pterodactyl in London -- enough for a decent lawyer to link to Skull Island and Kong's NY rampage. 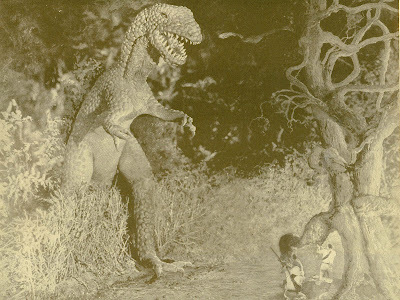 By owning Kong AND Lost World, RKO conceivably could have threatened anybody making a film involving modern-day dinos -- or anybody reissuing the silent feature. This might have greased the skids for the 1925 version's descent into limbo along with discouraging big studios. It was left to scrappy low-budget outfits to mine that vein, and evidently their success (and legal survival) helped make Lost World knockoffs a whole genre. Worth noting that One Million BC was a "period" film, more or less based on some D.W. Griffith stone-age shorts. Leaving out modern-day elements was a way around any possible Kong or Lost World claims. In a biography of AC Doyle (Teller of Tales: The Life of Arthur Conan Doyle, by Daniel Stashower), there's a mention of how Doyle went on lecture tour of the US before the film was released. He showed clips from the film, presenting them as actual documentary footage -- and many people bought it! Arthur Conan Doyle was an ardent believer in Spiritualism, which made for some friction in his friendship with Harry Houdini. 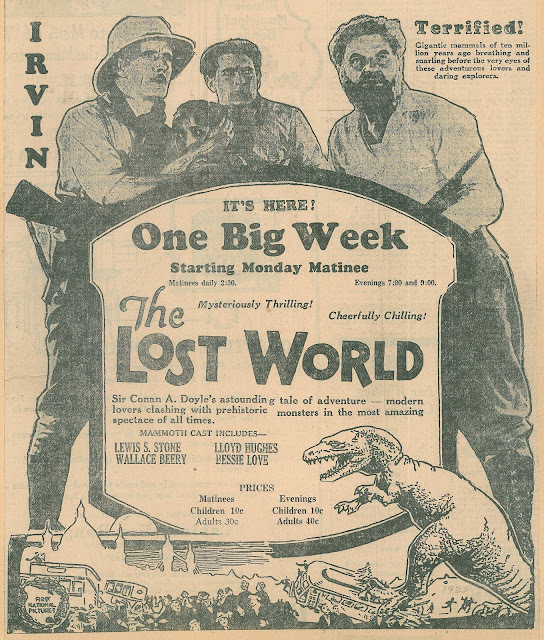 The legendary preview of footage from THE LOST WORLD was held at a meeting of The American Society of Magicians in New York. The assembled group of magicians including Horace Golden and Howard Thurston were stunned at the depiction of prehistoric beasts that was run that evening. Doyle refused to acknowledge the films origin, going so far as to claim it was a "Psychic picture" from another time. In regards to the trailer from THE LOST WORLD it is included in it's complete form on the Lumivision / Slingshot / Triton DVD. The Trailer on the George Eastman version is an amalgam of still frames mixed with footage from the film. Great post John. Wish I had had a cousin and neighbor to chip in. All I could afford was the 50ft. version of Tarantula! Oh, you've touched a nerve now, John! 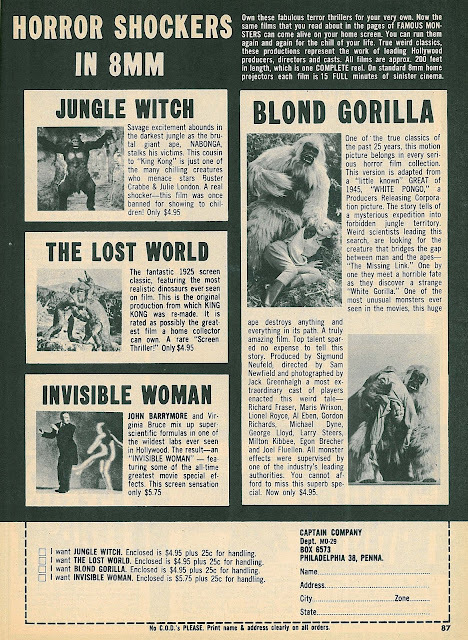 The Lost World was the first film I ever bought in 1968, an 8mm 6-reel print from Griggs Moviedrome which I still have (even if I wanted to unload it now, who would take it off my hands?). I had always heard that TLW was the first in-flight movie, edited down to six reels for screening on those old Ford Trimotors, and that the airline version was all that survived; I guess that was only a garbled (or apocryphal) version of the truth. I've also got the Lumivision release on laserdisc and the DVD of David Shepard's Image release. Thought I had it covered, but this Eastman House restoration is a revelation; just got back from Amazon and ordering my copy of the 1925/'60 double set. Can't wait! And speaking of Griggs Moviedrome, how I wish now I'd hung onto those brochures I used to have -- or at least could remember more of the titles he handled. Beau Brummel, Metropolis, Phantom of the Opera (got that one too), Barbara Frietche...that's about it. I'm sure there were other titles that meant little to me then but would be more familiar now. Wish I knew more about John Griggs too; must have been quite a fellow. Great post! THE LOST WORLD was not part of my 8mm library, alas, but it was just about my first exposure to a full length silent feature (well, okay, full length if you count the 55 minute version). The venue was THE TOY THAT GREW UP, the educational TV series from around 1963. I was soon an avid viewer of all their episodes, but that first show with its genuine prehistoric footage was the beginning of a life long addiction! That reference to "The Toy That Grew Up" rings a bell, Dave K. I may have seen "The Lost World" there, but can't remember for sure. Jim, those Griggs-Moviedrome brochures were really lovely, with great art by Anthony Phillips. He also did outstanding ads for Griggs that appeared in "The Classic Film Collector." Looks like you and I both had that 50 ft. "Tarantula" reel, Bill. I bought mine in a store somewhere in West Virginia. Remember when they used to have counter displays with Castle films? --- on spinning similar to ones that used to hold comic books? 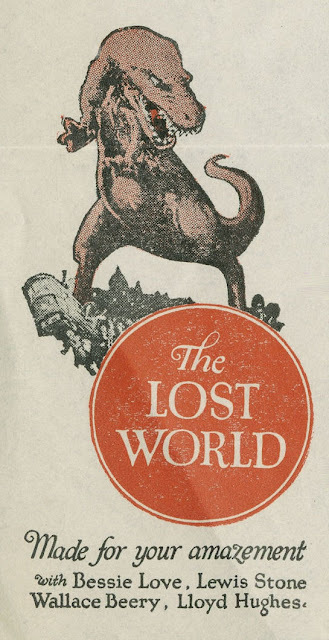 Scoundrel, I really appreciate all this dope about Conan Doyle and previous "Lost World" releases. I've ordered that Lumivision DVD of the Kodascope version. John Griggs was a very dear man. We used to correspond on a fairly regular basis when I was a child. 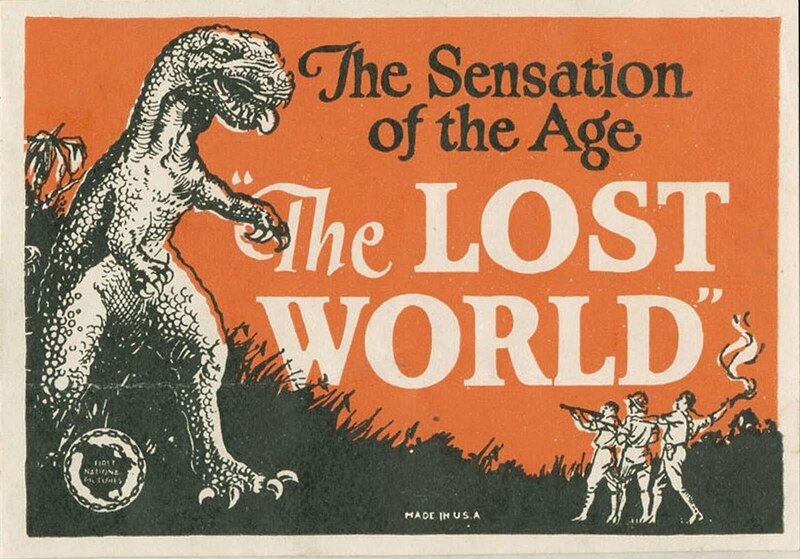 I never bought "The Lost World" from him, but I did with my little allowance "splurge" a full 50 bucks(!) on a title which would appear probably an unlikely -- and unusual choice to most of you: "The Garden of Eden", with Corinne Griffth and Charles Ray -- and the one thing I do recall, besides how much my family and their friends -- who were all in the business, of course, enjoyed it -- was, that for a standard 8mm print, what exceptional quality it was. Griggs really went to the "inth degree" to give his valued customers the service he believed they deserved! Thanks RJ, for those memories of John Griggs and Griggs-Moviedrome. I wish I'd known him. As it is, I only ordered a few times from him, but wished I could have gotten more of his fine offerings. I never knew he appeared on "The Honeymooners," by the way!